Noticed Sunday morning about 9:30 AM that IMDB.com (which is owned and hosted by Amazon) was down for at least an hour. This was confirmed by Fortune today and apparently affected Netflix and other Amazon AWS services. 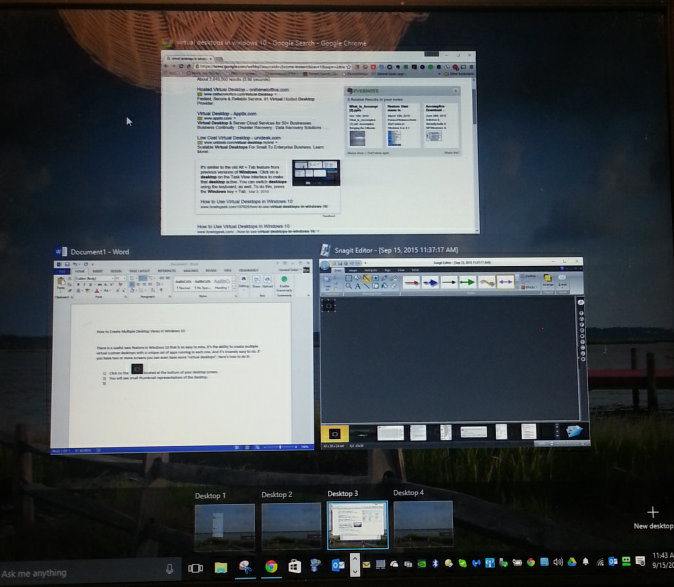 Did You Know You Can Easily Create Multiple Virtual Desktop Views in Windows 10? There is a useful new feature in Windows 10 that is so easy to miss. It’s the ability to create multiple virtual custom desktops with a unique set of apps running in each one. It’s insanely easy to do. If you have two or more monitors you can even have more “virtual desktops”. Creating a virtual desktop allows you to create uncluttered screens with just the applications running you need. This is not new but has previously been available from third party publishers. What can you use it for? Create screens for your personal use like recipes, sports events etc. Click on the multi-view icon located at the bottom of your desktop screen. You will see small thumbnail representations of the desktop. To the extreme right, you will see a [plus sign]: Click on the + sign to add New Desktop. The new desktop appears on the bottom of the screen next to the existing one. You can navigate through multiple desktops by using the keyboard combinations: Windows key + Tab key. To delete a desktop hover over it. You will then see an X appear. You can now delete one or all virtual desktops if you no longer need them. A tip: Pressing the Windows key and the [ + ] sign will magnify (zoom in) and pressing the and [ – ] key will zoom out. This is key combo shortcut for the Windows Magnifier tool. Author Howard SobelPosted on September 15, 2015 September 15, 2015 Categories Uncategorized1 Comment on Did You Know You Can Easily Create Multiple Virtual Desktop Views in Windows 10? Hey Cortana How Do I Get You To Listen To Me? Windows 10 has a virtual assistant named Cortana but to get the most out of it you’ll have to activate it. Without a little bit of research on your part might hailing Cortana might fall on deaf ears. Here’s a quick start guide to getting Cortana’s attention. Cortana can do a lot of things for you by voice commands on your PC. For example it can help you manage your calendar, track packages, find files, search the net, tell you what the weather forecast is chat with you, and even tell jokes. Since Cortana can be trained to your voice, the more you use Cortana the more is leans your habits and patterns and the more customized your results will be. Here’s how to get Cortana working for you. This will bring up the settings screen for Cortana. Turn “On” blue radio button for Cortana to get it to give you more suggestions, ideas, reminders, alerts and more. Turn on blue radio button “Hey Cortana” to get Cortana listening to your commands. You can choose respond best to “To Anyone” and Learn My Voice. Cortana will now begin the process of learning your voice and your computer habits. As the training progresses you will find that your results start getting much better. Now start having fun with Cortana your new personal assistant! Author Howard SobelPosted on September 2, 2015 September 2, 2015 Categories UncategorizedLeave a comment on Hey Cortana How Do I Get You To Listen To Me? My very trustworthy Asus notebook running Windows 8.1 threw a fit today. Windows has a built-in Automatic Repair tool that diagnoses and helps you repair problems that prevent you from booting up normally. I’ve encountered this feature many times before and it always goes into an endless loop of rebooting trying to fix the problem. Ideally, you just insert a bootable Windows 8 or 8.1 DVD and it will grab all it needs to make the repair. Yesterday, I spent nearly two hours waiting for it to finally find the files it needed to make the machine bootable. I used both Windows 8 and Windows 8.1 disks. But wait, that was after 25 reboot attempts. After about the 17th reboot attempt, I was about to capitulate. I walked out of the room to get some work done on another PC. When i came back Windows 8.1 was up and running. The Blue Screen of Death (BSD) we thought went away is just hidden from your view by Automatic Repair. My advice is to let Automatic Repair reboot as long as your patience will allow in the hopes it may recover. I’ve found System Restore to be a hit or miss process. But I always use it when given the opportunity. In the above case, system restore did restore the system but only after Windows Automatic Repair was able to resolve the boot up problem through the nightmarish process of playing chicken with Windows. Since we know that sooner or later most of us are going to run into system corruption issues you might as well prepare for it. Who doesn’t hate doing a clean install? It takes a lot of time if you have lots of desktop applications installed. The good thing about Apps and AppStores is you can bring all your apps back without having to find the registration codes. Windows 8.X has a good options for refreshing all the necessary system files that may be corrupted and that cause programs to crash. It’s the Refresh But Save My Settings feature. This will preserve all your custom settings and files but you’ll need to reinstall all of your software. I would keep a list of all your installed desktop apps. Take a screen shot of your control panels “Uninstall Programs” screen or you can write them down. or capture them with the Evernote screen app. I also recommend that you put all executable files in a download directory (preferably on redundant storagte) and all registration codes should be written down and backed up to a USB flash drive or disk not on your computer. Oh and just one more thing. Backup all your files and applications install media to a hard drive and cloud based storage. If you do all this you’re going to have a really good chance at recovery with the shortest amount of down time. You can even plan periodic Windows Refresh to keep your machine running fast.You can also create a system image and back up that image to an external hard drive. System images are sometimes corrupted too so don’t bet on any one horse. Howard has reviewed, written about, tested, marketed, published and distributed software for two decades. He is the co-founder of the Windows User Group Network (WUGNET) a serial entrepreneur and product marketing consultant. I have a pile of Bluetooth devices but recently received the Jabra Stealth to review. The first thing I noticed about the Jabra Stealth is its unique design and surprisingly light weight. This is achieved through the use of what Jabra calls MicroPOWER battery technology which they attribute to its extremely light weight, longer talk time, and increased comfort. I assume this is another word for a small but powerful battery. In the technology industry trademarked descriptions are always a marketing plus. So I put it on. This is the most comfortable Bluetooth headset I’ve ever worn. The Jabra Stealth was impressive in all areas. Light weight and comfortable you’ll forget it’s on your ear. It comes with 3 ear gels as well as two ear hooks. I normally have to try on each ear gel that comes with Bluetooth headsets to find the right size and sometimes none of them work well for me. Not so with the Jabra ear gels. I immediately got a great fit. That was a bonus. The Jabra lacks a volume button but I didn’t find that to be a problem in every day usage scenario. There are just three buttons. On/off switch, the Answer/end bar on well-designed metallic looking micro boom, and the voice button easily located on the inside of the body of Jabra microphone. I find that I’m always fumbling around looking for the volume control on my headset. This is not only a pain but also a distraction while driving. Since the Jabra Stealth doesn’t have one, its buttons are a snap to locate. In this case it’s a feature not a design flaw. Sometimes less is more. The setup process took me less than two minutes. The device can be paired through traditional Bluetooth pairing by just pressing the Answer/end switch which provides voice guided instructions. If your mobile device supports NFC you have that option as well. The Answer/end button also supports native device voice control like many other devices giving you access to Google/Now or Siri. The only problem I encountered was a small detour figuring out how to open the micro USB tab. They should ad an additional graphic showing exactly how to open it. It also only comes with a micro USB to USB connector. No plug in device. I think they should through in the full recharge adapter considering the pricing. Although I used another micro USB adapter to charge it and worked just fine. 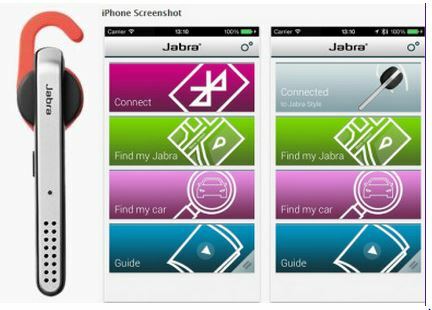 You can download the Jabra Assist apps for the Stealth on both Android Play and Itunes App Store. The app has some great features. Here’s the description from the Android store. Find my Jabra (for Jabra Classic, Jabra Mini, Jabra Stealth, Jabra Storm and Jabra Style). Each time the headset is in use the position is geo tagged. If the headset gets misplaced, you can see on the map on your smartphone where it has been used last time making it easy to find the headset again. The application can even show the easiest route back to your headset. Furthermore if the headset is lost but still in range, you can activate a sound in the headset, making it easier to find again. Find my Car (for Jabra Freeway, Jabra Drive, Jabra Streamer and Jabra Tour). Each time you leave your car, its position is geo tagged. You can see your current location and where you left the car at any time on the phones build in map. The application can even show the easiest route back to your car. The application also lets you take a picture of the surroundings when leaving the car, making it even easier to relocate your car. Responsible Driving (for Jabra Freeway, Jabra Drive, Jabra Streamer and Jabra Tour) Jabra Assist provides a new feature set to respond to the increasing focus on responsible driving, avoiding accidents when using your smartphone while driving. When you connect to a Jabra Freeway, Jabra Drive or Jabra Tour speakerphone or Jabra Streamer controller, your smartphone will switch into safety mode. An incoming message will be automatically replied stating that you are in the car driving and will return later. Battery meter (for Jabra Classic, Jabra Mini, Jabra Stealth, Jabra Storm and Jabra Style). The battery meter gives you a simple visual indication of the remaining battery time on your Jabra device. It will give you a warning when the level reaches 50%, 25% and 10% of the remaining talk time. Pairing guide. The automated pairing guide will guide you through the pairing session in an easy step-by-step process. Animated guide. The guide gives you an easy to understand introduction to the key features of the Jabra Assist smartphone application. User manual. Need to check the user manual? No worries; as you now have access to the full user manual from within the application. Enjoy all these great features and more when you download the Jabra Assist app. Note that Jabra Assist application only works in conjunction with the Jabra Classic, Jabra Mini, Jabra Stealth, Jabra Storm, Jabra Style, Jabra Freeway, Jabra Drive, Jabra Streamer and Jabra Tour products. Sound Quality – The Jabra does a great job filtering out background noise. I would rate it equal to or better than Plantronics, Jawbone, or Blue Ant. Pro: Exceptional comfort, nice design, long battery life, good sound and noise dampening. Con: No Volume Control… USB plug a little hard to open without directions. I recently received an update message from Windows messenger informing me a new update was available which of course was “Skype”. I already use Skype but I installed it again. The same day I also switched from Windows Security Essentials to Avira to do a test and then switched back. Somewhere after that process, I discovered that Windows Mail would not work. Each time I launched it an error message indicated it could not find WLDCore.dll. Google and Bing turned up issues but they were older. They also referred to a common shared folder c:\Program Files\Windows Live\Shared. Unfortunately, this folder did not exist on my Windows 7 installation probably due to updating by uninstalling and reinstalling Windows Essentials and Windows Security Essentials. The fix: reinstalling Windows Essentials did not seem to do the trick. However I then went into Control Panel and initiated an uninstall and told Windows Essentials 2012 to repair just Windows Mail. Voila! Worked like a charm. Will You Continue to Use XP at Your Own Risk? This news should come as no surprise although Microsoft had previously decided to extend XP’s life cycle for various scenarios with OEMs and enterprise. Although XP seems like a cat with nine lives users who continue using it, do so at their own risk after the April 8 deadline. What are the risks of continuing to use XP? According to the CERT alert, computer systems running unsupported software are exposed to an elevated risk to cybersecurity dangers, such as malicious attacks or electronic data loss. Users may also encounter problems with software and hardware compatibility since new software applications and hardware devices may not be built for Windows XP or Office 2003. “Organizations that are governed by regulatory obligations may find they are no longer able to satisfy compliance requirements.” The also recommend that you can minimize some risk by switching to another browser that is updated and compatible with XP ie: Chrome or Firefox. Gartner estimates as of 2013 that there are globally 1.63 billion PCs. With that scenario you could be looking at around 500 million computers running XP and over a billion people. If these 28%-30% predictions are correct. You should ask yourself if you really want to roll the dice with your information and security by continuing to cling on to an operating system released to the public on October 25, 2001. Another very small study by Flexera and IDC concluded incredibly, of 752 organizations responding “28% still need to migrate half or more of their applications accounts off XP. Considering that Operating Systems are now coming out faster than rabbit turds, a 13 year run is astonishing. Will you push your luck and continue to ride the OS bull or switch to Windows 7, 8.1, Mac or Android? You’ve probably got your monies worth from XP by now but it could start costing you a lot more in the future if you run into some major security flaws that led to identity theft, or loss of data. Every day there is a new hack. They are coming fast and furious on even newer operating systems. I’m sure some of you will think this is a devious plot by the evil software Giant Microsoft. But really 13 years is a good ride. US-CERT is part of DHS’ National Cybersecurity and Communications Integration Center (NCCIC). The Department of Homeland Security’s United States Computer Emergency Readiness Team (US-CERT) leads efforts to improve the nation’s cybersecurity posture, coordinate cyber information sharing, and proactively manage cyber risks to the Nation while protecting the constitutional rights of Americans. US-CERT strives to be a trusted global leader in cybersecurity – collaborative, agile, and responsive in a dynamic and complex environment. Author Howard SobelPosted on March 12, 2014 September 12, 2014 Categories UncategorizedLeave a comment on Will You Continue to Use XP at Your Own Risk?